The sight is common on the reef: a parrotfish swims by and a thin stream of coral dust and sand particles is ejected from underneath. Coral sand is made here in the belly of the beast. Here’s a picture I took last week in Bonaire. You can see the stream of sand coming from below. Parrotfish caught in the act of creating more sand. Our question is simple: How much sand is created by an average parrotfish in the course of a year. One set of sources says it’s 200 pounds, another says it’s 2000. One of those can’t be right. Unfortunately, the link to the Thurman article specified in Wikipedia is dead (it was last checked in 2009) and the target site no longer supports this reference. I spent some time searching for this chapter, and while I can find lots of references to it, I can’t find the book chapter itself. Even worse, many of the references to this chapter I found are clearly copies of the citation and link from Wikipedia. (Even at such well-respected sites as the Encyclopedia of Life whose parrotfish page-- http://eol.org/pages/5214/details—would be considered authoritative—merely quote the Thurman reference and give the same link to a dead page.) Sigh. Case closed? Not yet. Unfortunately, THEY don’t give any reference for that bit of data. Where did THEY get that information from?? But read that carefully: This means “all of the parrotfish on the reef in 1 acre” are producing around 2,000 pounds of sand over the entire acre. That’s the contribution by all of the parrotfish working (so to speak) together. Bšhlke, J.E., and C.G. Chaplin 1993. Fishes of the Bahamas and Adjacent Tropical Waters. University of Texas Press, Austin, 464-482. … back to the library. I ordered this book and got it along with the Thurman book. Thing is, “Fishes of the Bahamas” is a giant tome: 771 pages of fish data. Not much plot, but still pretty interesting to read (if you’re a diver). Bardach, John E. "Transport of calcareous fragments by reef fishes." Science 133.3446 (1961): 98-99. Let’s do some Google conversions to check this number. means 2052.0 lbs per acre (an acre is pretty close to 1 football field). I wanted to get the full text of the paper, but that’s $20 for a “short-term use” (1-day) license. As you can imagine, I’m not about to pay for that. But we still don’t know how much sand/fish/year that represents. To figure this out we need to know How many parrotfish live in on an acre of reef? Bruggemann, J. H., et al. "Bioerosion and sediment ingestion by the Caribbean parrotfish Scarus vetula and Sparisoma viride: implications of fish size, feeding mode and habitat use." Marine ecology progress series. Oldendorf 134.1 (1996): 59-71. That led me to the PDF file, which I printed out and carefully read. This is when I realized that this is a much more complex problem than just looking up the number of parrotfish / square meter on the reef. By reading this (and a few other papers) I learned that the density of parrotfish on the reef varies hugely by depth. (Shallow water has a lot; water deeper than 50 feet has fewer.) They also sleep at night, and feed only between 7AM and 6PM (and, btw, they mate daily, between 7AM and 9AM… but I digress). I also found out that the quantity of coral ingested when they bite varies a good deal by the size of the fish, but it varies even MORE depending on the kind of parrotfish. 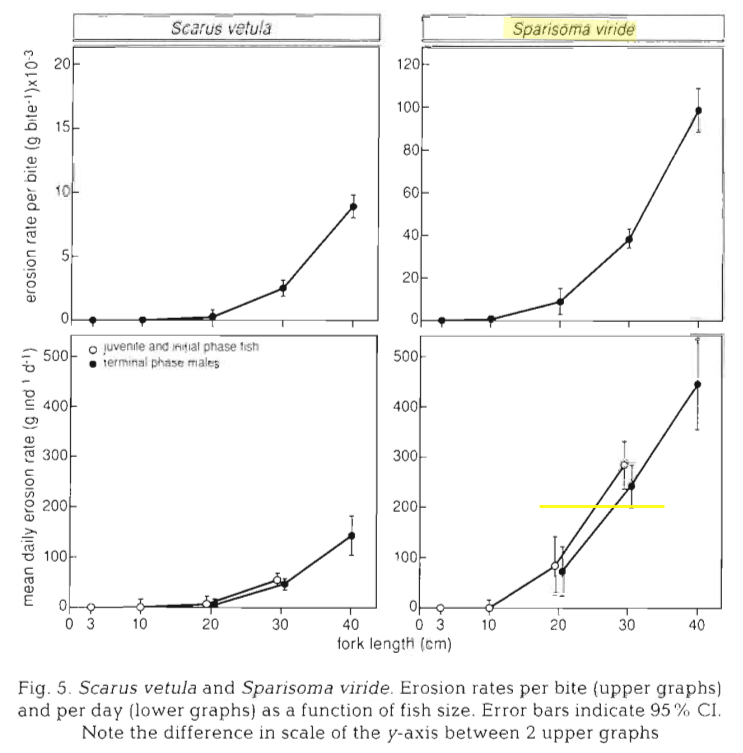 Among other things, we HAVE to be careful not to mix up our parrotfish species (e.g, Hawaiian parrotfish with Caribbean parrotfish, or even parrotfish that live side-by-side in the waters of Bonaire—as the paper points out “…the erosion rates per bite by Sparisoma viride is more than an order of magnitude higher than in Scarius vetula.” That is, the Stoplight parrotfish (Sparisoma viride) has a bite size that’s ten times larger than that of Scarius vetula (Queen parrotfish). If this is correct, then to get 2000 lbs of sand contributed per acre by all of the parrotfish, we’re going to need around 10 Stoplight parrotfish / acre. By my direct observation on the reefs of Bonaire, that seems low, but let’s see if we can’t find some numbers in the literature. Choat, J. Howard, et al. "An age-based demographic analysis of the Caribbean stoplight parrotfish Sparisoma viride." Marine Ecology Progress Series 246 (2003): 265-277. He “conservatively estimates” 4 individuals / 300 square meter plot. is 4046.86 square meters in an acre. If we divide 4046.86 / 300, we should get an estimate of the number of Stoplight parrotfish / acre (according to Choat). This number is 13.5, a little higher than we estimated before, but not a crazy number. But I figured out that 1 Stoplight parrotfish generates around 0.6 pounds of sand / day (on average, mid-depth of the reef). I did this by going back to the original papers (using Scholar and Google Books) to dig out the charts and original data. In some cases, it’s hard to get to the original source document. As you saw, I had to use my local library to get to the original paper by Thurman. But once I had it, the rest of the story unfolded easily. (Although slowly—I had to look up a lot of words. Acanthurids and scarids and fork length were all new terms for me). This is a nice example of sensemaking: Pulling together information from multiple resources and cross-checking them against each other. In truth, I read much more than I’ve reported on here. I didn’t want to tell you that I actually read about 10 papers, some of which were duds. They seemed good from the abstract, but the reality was that the paper encoded the data in an unhelpful way or that it was about parrotfish on some other continent, or the wrong kind of fish. AND... a beautiful 2 minute video of parrotfish feeding from the "Blue Planet" BBC series (discovered by regular reader Ramón... thanks!). Note the part at 56 seconds in--a lovely shot of sand being delivered to the reef. sediment ingestion by the Caribbean parrotfish Scarus vetula and Sparisoma viridae: implications of fish size, feeding mode and habitat use. Mar Ecol Prog Ser 134:59-71. Thurman, H.V; Webber, H.H. (1984). "Chapter 12, Benthos on the Continental Shelf". Marine Biology. Charles E. Merrill Publishing. pp. 303–313. van Rooij, Jules M., et al. "Resource and habitat sharing by the stoplightparrotfish, Sparisoma viride, a Caribbean reef herbivore." Environmental Biology of Fishes 47.1 (1996): 81-91.
sediment release in parrotfishes (family Scaridae) on the Great Barrier Reef. Mar Ecol Prog Ser 117:127-136. Scaridae) on the Great Barrier Reef, Australia. Mar Biol 125:795-800. Answer: What IS that thing? Another undersea mystery. Yesterday's challenge wasn't all that hard. There were a number of good clues here. I'd said "In around 30 feet of water (10 m), I found several instances of this... "
General world knowledge tells you that this is something in a tropical reef, and it occurs not too deeply. I also gave you a few clue words: "spheres" and calling them "pearly." I wanted to say that because the opalescence doesn't quite come across in the photos. When I started this search, I really didn't have any clue what they were. I figured they were some kind of algae, but that was a pure guess. The ocean has all KINDS of mysterious creatures in it, ones that defy your normal terrestrial boundaries. And that was enough to get me to a page on "Coral reef plants" which mentions "...Grape algae (Valonia ventricosa) - this odd algae grows in a spherical form with peg-like attachments that fasten it to a hard surface..."
In this case, it was the text, rather than the image that caught my attention. I'd described it as "spherical" because it (and the pearly quality) were the most striking characteristics. I figured that anyone writing about it would comment on that. 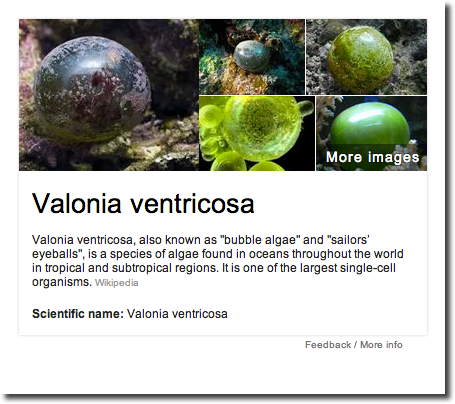 So I next looked up the scientific name, Valonia ventricosa, and I knew I had the answer. The Knowledge Panel (see below) had an image that was striking. Valonia ventricosa, also known as "bubble algae" and "sailors’ eyeballs" (a remarkably vivid common name) is a species of oceanic algae around the world in tropical and subtropical regions. Even more amazing: These things are single cells, one of (perhaps THE) largest single cell organism around. Clicking on the Wikipedia entry, I read a bit about them, and then, as I often do, I clicked through the links on the article. Sure enough, it's still there (I should go fix up the Wikipedia entry to reflect this). And it IS an interesting article. These things are also called "sea pearls" (makes sense), AND the article mentioned "...Ventricaria ventricosa, or Valonia ventricosa..."
Well.. that's interesting. Two names for the same plant? I kept following up the other links (and found other problems), but was impressed when I followed the last link on the Wikipedia article, a reference to the AlgaeBase site. The link is to the AlgaeBase description of the "sailor's eyeballs." This is pretty clearly the definitive site for questions about algae. And here you can see the story. Agardh, J.G. (1887). Till algernes systematik. Nya bidrag. (Femte afdelningen.). Acta Universitatis Lundensis 23(2): 1-174, 5 plates. If you're curious, you can see the original publication. (PDF) This is the way science used to operate--it's in Latin. It's long text passages. There are a few lovely sketches at the end. But what's with the two names? The original name was given by J. Agardh in the late 19th century. But as AlgaeBase points out: “This name, Ventricaria ventricosais, currently regarded as a taxonomic synonym of Valonia ventricosa." Renaming and reclassification happens all the time. What USED to be called a brontosaurus is now called an apatosaurus. A similar thing happened here. A newer publication came out put Valonia into a new category, Ventricaria. In that paper, Olsen and West point out that our favorite algae actually belongs to a newly described genus that they call Ventricaria. If you look at publications since 1988, they all (well, nearly all) use the new name. 1. What IS that thing? Answer: Ventricaria ventricosa, previously known as Valonia ventricosa. Common names: bubble algae, sailor's eyeballs, sea pearls. That took me to http://www.reefkeeping.com/issues/2002-02/hcj/feature/ which has a long, really interesting article with more information about Valonia / Ventricaria (including great photos of other forms of the algae). It ALSO has a long section about controls, including the use of snails and crabs to eat them. In particular, the article mentions the crab Mithrax sculptus (aka "green" or "emerald" crab) as a way to control the spread of bubble algae in your tank. 2. What biological agent might you use to control them in your salt water aquarium? Answer: You might try using a crab in your tank to eat up the bubble algae. However, not everything is perfect. 3. (Extra credit) Why does it now seem that the use of this biological agent might be a really bad idea? The Reefkeeping.com article also mentions that the crabs, as they dine, might well end up spreading spores from the interior of the bubble, and end up making matters worse. You start with one algal cell, but end up with them infesting the tank. 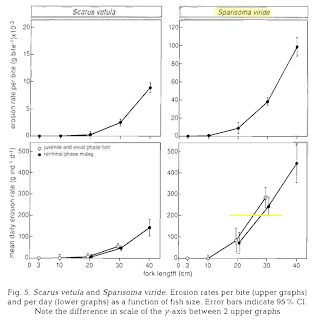 And found this interesting article that confirms what we read at ReefKeeping: Efficiency of using emerald crabs Mithraculus sculptus to control bubble alga Ventricaria ventricosa (syn. Valonia ventricosa) in aquaria habitats (see (2) below). "...as the crab tears the algal cell apart, the cell liquid that contains juvenile cytoplasmatic spheres is released into the water; this behaviour might contribute to algal dispersal and consequently algal infestation. These results seem to indicate that M. sculptus might not be such an efficient bio-controller of the pest V. ventricosa as previously thought..."
Search lessons: There are a couple of things to note here. 1. Keyword choice: Try to use terms that you think someone else would use. If it's not working for you, ask someone else for the words they would use to describe it. 2. Wikipedia as a starting point: As we've discussed, Wikipedia is a great place to start your research on a topic, but don't think of it as the ending point. In this article, Wikipedia has dead links (easily fixable), and uses outdated names in the article. 3. Triangulate what you find: Look for multiple sources to get the same data in different ways. I used Scholar to find that article about emerald crabs, and I found AlgaeBase as a great authoritative source for the latest on algae from a botanical perspective. Tomorrow, the resolution of the parrotfish problem! (1) Olsen, J.L. & West, J.A. (1988). "Ventricaria (Siphonocladales-Cladophorales complex, Chlorophyta), a new genus for Valonia ventricosa." Phycologia 27: 103-108. (2) Figueiredo, Joana, et al. "Efficiency of using emerald crabs Mithraculus sculptus to control bubble alga Ventricaria ventricosa (syn. Valonia ventricosa) in aquaria habitats." Journal of the Marine Biological Association of the UK88.01 (2008): 95-101. Wednesday search challenge (9/25/13): What IS that thing? Another undersea mystery. Diving in Bonaire was immensely satisfying, it also led to multiple mysteries, each perfect for a search challenge. I'm trying hard to not turn SearchResearch into a long series of "Mysteries of the Deep!" While there I took several hundred underwater photos, and when I was going through them this past week for the parrotfish problem (more on that later), I ran across a few snapshots of something I couldn't identify. These spheres are a remarkable sight. They're not pearls, although they definitely have that kind of pearly, opalescent quality to them. They're about 2 inches (5 cm) across, slightly bendable when you press on one, but firm too. They're strongly attached to their substrate, in this case, sponges, but I saw them attached to other things as well. When I finally figured out what they were, I learned they're kind of a pest in saltwater aquariums, and aquarists look for ways to control them. (Although they are fairly remarkable in appearance.) They're certainly not a pest in Bonarian waters; I'd always see a few per hour while swimming over the reef. 2. What biological agent might you use to control them in your salt water aquarium? Let us know HOW you found the answer. For SearchResearchers, the search method to get to the right answer is as important as the answer itself! It's how the rest of us learn to be better searchers. Parrotfish update: I hope to finish my update to the "parrotfish poop" problem from two weeks ago. That is, who was my advisor's-advisor-advisor-advisor-advisor-advisor-advisor was (back 7 PhD generations). 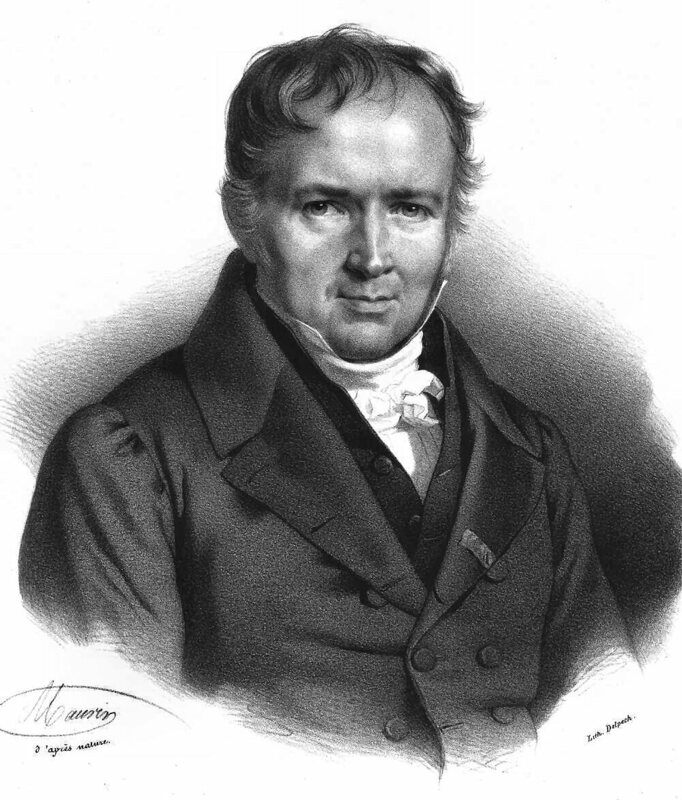 Answer: Simeon Denis Poisson (one of the greatest mathematicians of the early 19th century). But probably the simplest way to figure out my great (* 7) advisor is to use The Mathematics Genealogy Project advisor tool. If you start with my name and work backwards - Daniel Russell - you'll find that I'm a descendent of S. D. Poisson. The Genealogy Project tool shows up pretty high in that list. As several readers pointed out, once you do the search and notice that there's a tool labeled "genealogy," the rest is simple. Why use my full name in the search? Lesson 1: Because different kinds of sites use different conventions for naming individuals. For genealogies, typically you want to use the full name. (But be careful; you still might have to hunt around on name variations. Geoffry vs. Jeffry vs. Jeffery, etc.) I used my full name here because I know that this is the convention for official documents (and the PhD degrees are very, very formalized). And of course Poisson's advisors were the even more famous mathematicians / physicists Joseph Louis Lagrange (1754) and Pierre-Simon Laplace (~1760). Still, I like Poisson as one of my great-advisors because his Poisson distribution is used so often in statistics and computer science. (1) When I first learned about a Poisson distribution and figured out how it works, I felt... empowered. It sounds silly, I know, but for the first time in my undergraduate career, I felt as though I'd learned something that I would never have figured out on my own. It was my first moment of mathematical awe and surprise. I never imagined that I was intellectually related to the man himself. That was a second great surprise. Lesson 2: Be sure to look for a tool that can do the computation for you. Sometimes (especially for repeated information links, like we see in this kind of a problem), you'll find a tool that will do the heavy lifting for you. (1) Background: In the context of queueing theory the Poisson distribution is a pretty good model for how items arrive into a queue that needs to be managed. Queues are pretty fundamental to the way all computers work, so everyone in CS needs to learn this at one point or another. Answer: What kind of fish? Followup: What made that mark on the land? Answer: What made that mark on the land?